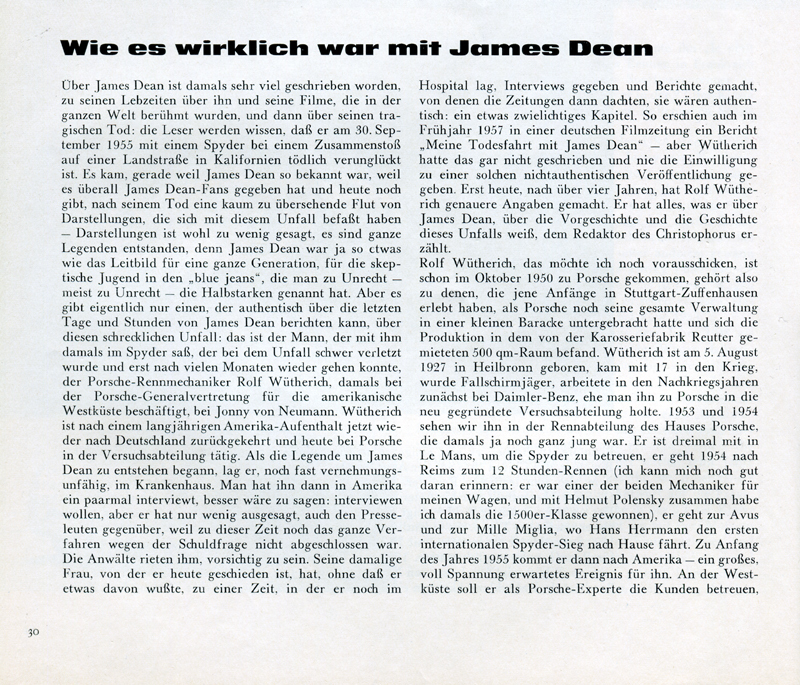 SCVHistory.com | James Dean's Final Ride | Passenger Remembers: Wie Es Wirklich War (Christophorus 43/1960). Translation by Leon Worden, 2015. Much was written about James Dean at the time, about his life and his movies, which were famous throughout the world, and then about his tragic death; the reader knows that on Sept. 30, 1955, he had a fatal accident in a Spyder on a California highway. Because James Dean was so famous — at a time when there were James Dean fans everywhere, and there still are today — his death inspired a flood of accounts of the accident. "Accounts" isn't strong enough; entire legends grew, since James Dean was something of a model for a whole generation, for the skeptical youth in the blue jeans who so wrongfully — usually wrongfully — were called beatniks. But there was really just one person who can report authentically about the last days and hours of James Dean, and about this terrible accident. 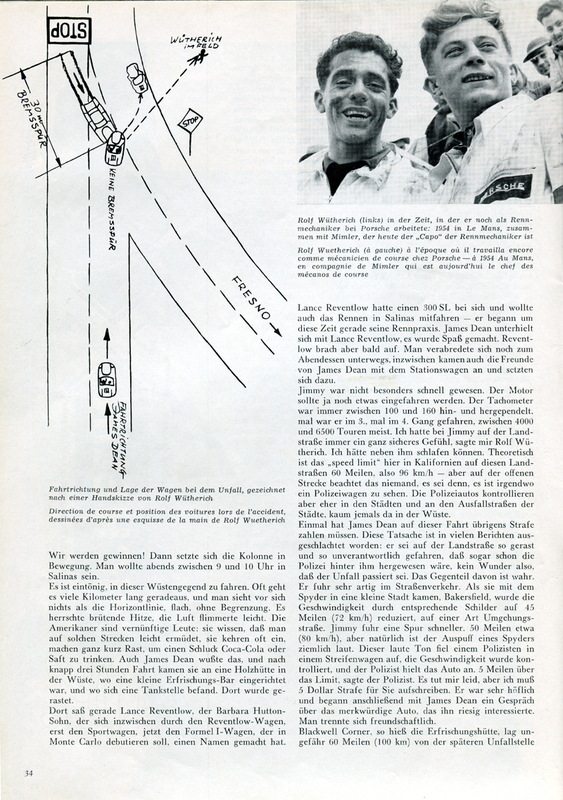 That is the man who sat with him in the Spyder, who was badly injured in the accident and only after several months could walk again — the Porsche race mechanic Rolf Wütherich, who was working at the time with the Porsche representative for the American West Coast, Jonny von Neumann. After a yearlong stay in America, Wütherich has returned to Germany and is active in Porche's experimental division. As the legend about James Dean began to evolve, he lay in the hospital, not fit to be questioned. People interviewed him a few times in America, although it would be better to say they wanted to interview him; he said little to the media because up to this time, the question of guilt hadn't been settled. The lawyers advised him to be careful. His then-wife, from whom he is now separated, gave interviews and made reports — without his knowledge, while he lay in the hospital — which the newspapers thought were authentic. A shady chapter. 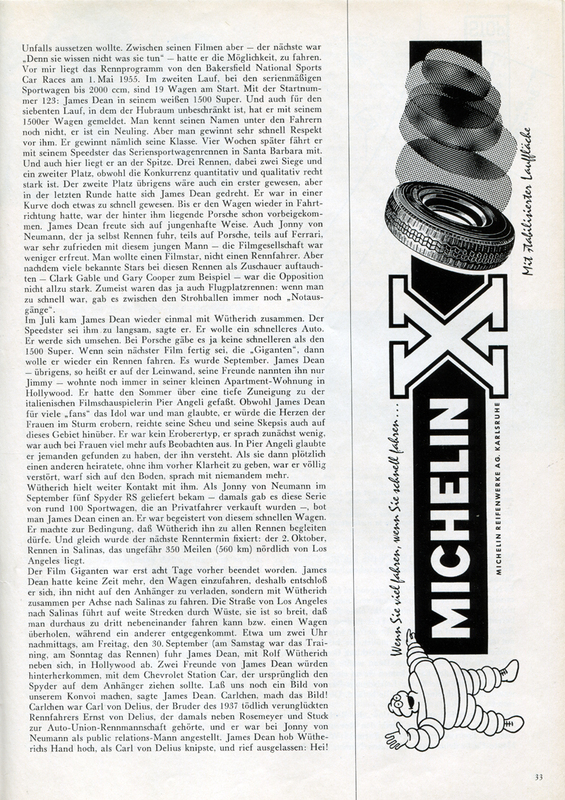 And thus appeared the story, "My Death Ride with James Dean," in a German film magazine in the Spring of 1957 — but Wütherich didn't write it and never gave his consent to have such an account published. For the first time today, after more than four years, Rolf Wütherich has given a more precise account. He has told all he knows about James Dean and about the events preceding the accident, and about the accident itself, to the editor of Christophorus. 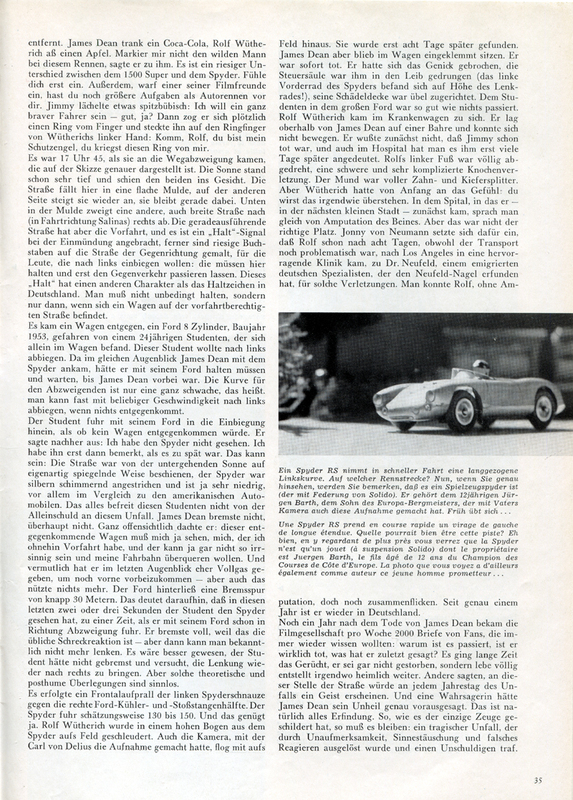 First let me say that Rolf Wütherich came to Porsche in October 1950 and thus is among those who experienced the beginnings in Stuggart-Zuffenhausen when Porsche's entire management was housed in a small barracks and its production facility was located in the rented, 500-square-meter Reutter auto body factory. Wütherich was born in Hielbronn on Aug. 5, 1927; he entered the war at 17, served as a paratrooper and worked in the postwar years first at Daimler-Benz before being recruited into Porsche's newly established experimental division. 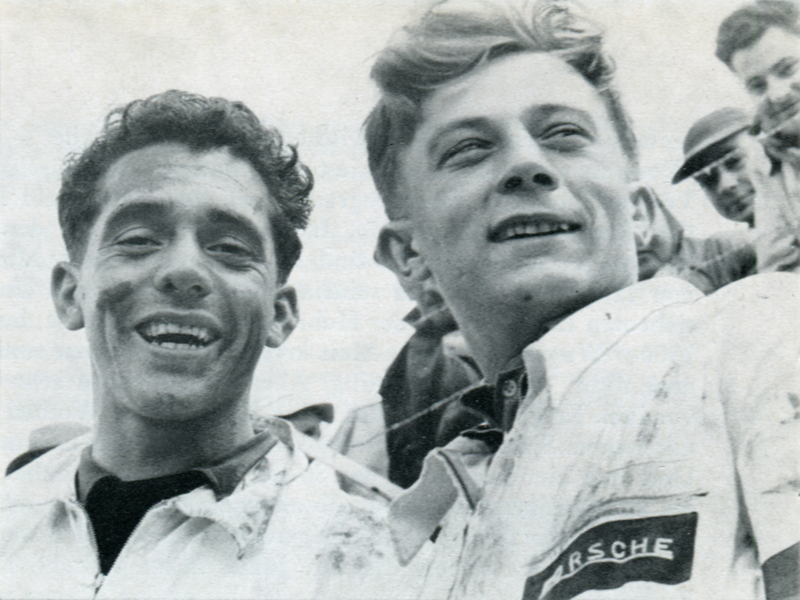 In 1953 and 1954 we find him in the racing division of the House of Porsche, which was then quite new. He went along three times to Le Mans to care for the Spyder; he went to Riems in 1954 for a 12-hour race (I remember it well: He was one of two mechanics for my vehicle, and together with Helmut Polensky I won the 1500 Class); he went to the Avus and to the Mille Miglia, where Hans Herrmann drove the Spyder to its first international victory. At the beginning of 1955 he came to America — a major, stressful event for him. He was to deal with customers on the West Coast as a Porsche expert, especially the sport drivers, and at that time in America there were more people who raced sportscars than here. He flew to Los Angeles at the end of March. Within 14 days he already knew James Dean, for James Dean had a 1500 Super speedster — new, white-lacquered, with the three-part motor housing. James Dean was 24 years old and just had done a movie that would make him world famous: "East of Eden." His father had been a dentist, but the boy never knew him and was raised on a farm by his grandparents. As a youngster he took an early interest in all types of sports, especially riding, boxing, ballet and motorcycle racing. Before he bought the Porsche speedster, he had a big, 2-cylinder Harley-Davidson, which he preferred to drive on the open road, as well as in some smaller, Motocross-type contests. To a great extent he developed his sense for driving on the motorcycle. Overall, James Dean was a sensitive character. He went his own way, and not the usual way of the stars. He hated industry parties, hated to show off; he was rather shy around people and stood off to the side, just to observe people from afar. He had no star attitude; it may be that while many considered him snooty and arrogant, it masked a hidden shyness. In the circle of sportscar enthusiasts who went to the races, he felt the most comfortable. Among these people, he wasn't seen as a movie star but only as a good driver. His technical knowledge, which also came from the motorcycle, was astounding. It was no problem for him to adjust the carburetor or the valves. He wasn't shy about getting his hands dirty. He became an actor the usual way. He completed acting school; he proved to be talented, came to the New York stage, played on Broadway and embodied the type who was drawn to the film industry in Hollywood. There his passions were known, and during days off from filming and on weekends, he was forbidden by the film company to participate in racing. Not because he might be late, or distracted, but because of the danger of a racing accident. But between his films — the next was "Rebel Without a Cause" — he had the opportunity to drive. I'm looking at the racing program from the Bakersfield National Sports Car Races of May 1, 1955. In the second heat, in the 2000-ccm sportscar series, there were 19 cars at the start. With No. 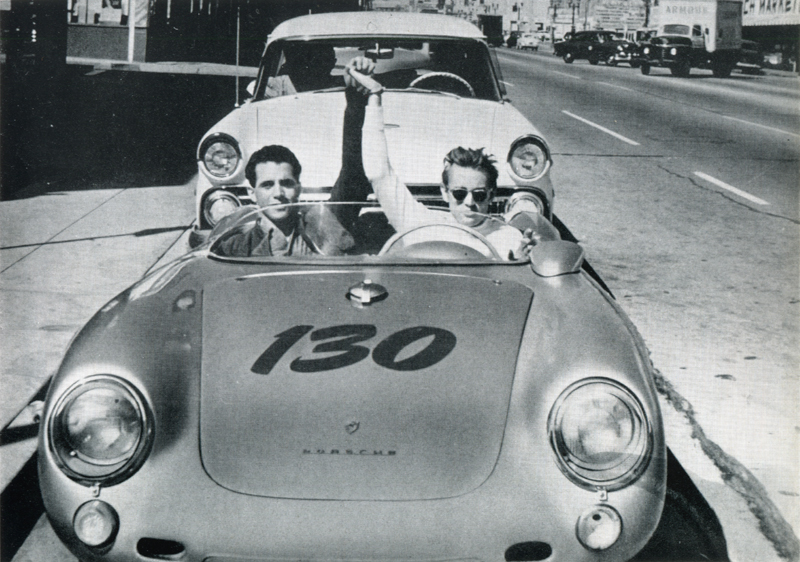 123: James Dean in his white 1500 Spyder. And also for the seventh heat, with unlimited engine capacity, he entered with his 1500. His name wasn't known as a driver; he was a newcomer. But he quickly won respect. He won his class. Four weeks later he drove his speedster in the sportscar series race in Santa Barbara. Here, too, he was great. Three runs, two wins and a second place, even though the competition was tough both quantitatively and qualitatively. The second place, incidentally, would have been a first place, but in the last lap James Dean spun out. He took a curve a bit too fast. As he was correcting his turn, the Porsche that had been behind him overtook him. 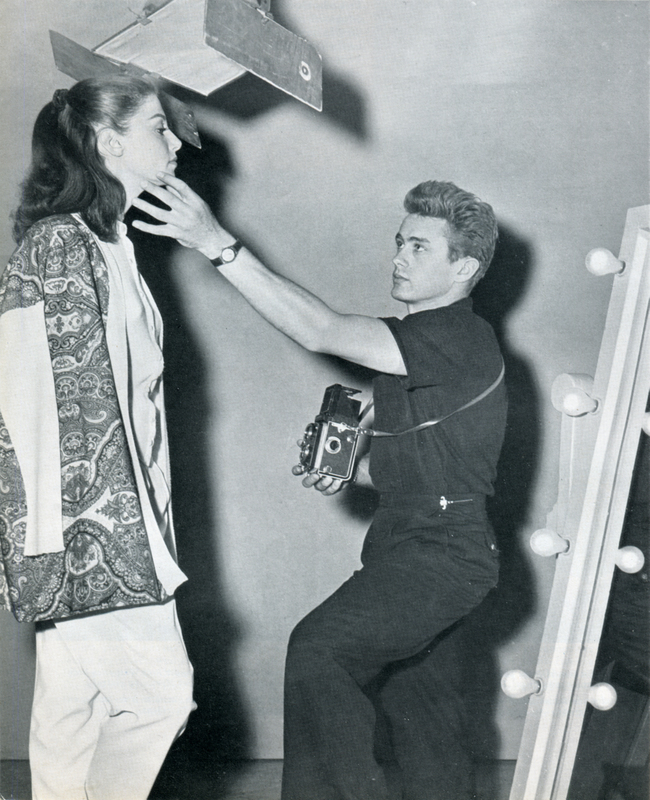 James Dean was boyishly happy. Even Jonny von Neumann, who drove in the race, partly in a Porsche, partly in a Ferrari, was very satisfied with this young man. The film company was less satisfied. They wanted a movie star, not a racecar driver. But after several well-known stars showed up to watch the race — Clark Gable and Gary Cooper, for example — the opposition was not too strong. It was mostly airfield racing; when one went too fast, there was always an "emergency exit" between the haystacks. In July, James Dean got together again with Wütherich. The speedster was too slow, he said. He wanted a faster car. He would look around. 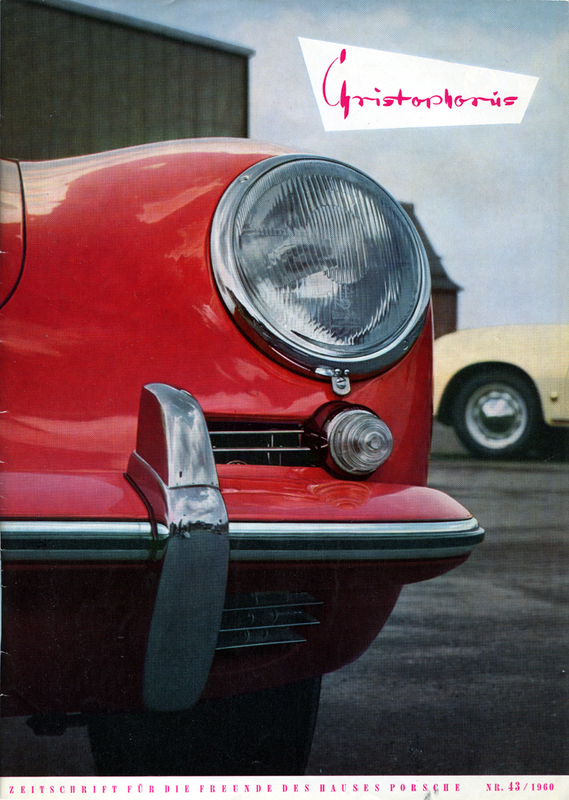 Porsche had nothing faster than the 1500 Super. When his next film, "Giant," was finished, he wanted to drive in another race. It was September. James Dean — at least that was his name on the marquee; his friends called him Jimmy — still lived in his small apartment in Hollywood. 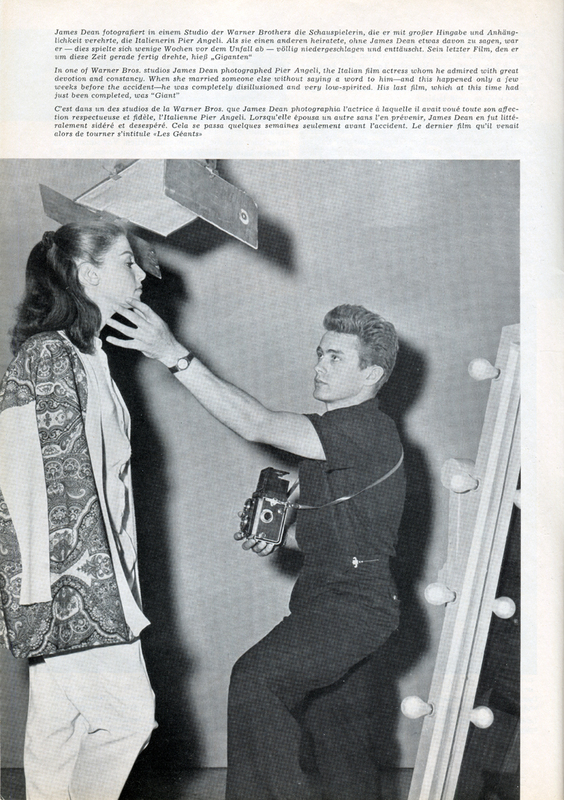 He had developed a deep affection over the summer for the Italian actress Pier Angeli. Although James Dean was the idol of many fans and it was thought he would conquer the hearts of women by storm, his shyness and skepticism hampered him in this area, too. He was no conqueror type; he spoke little and was more an observer of women. In Pier Angeli he believed he had found someone who understood him. When she then suddenly married someone else, without first giving him a clear reason, he was deeply upset, threw himself on the floor and wouldn't speak to anyone. Wütherich made contact again. 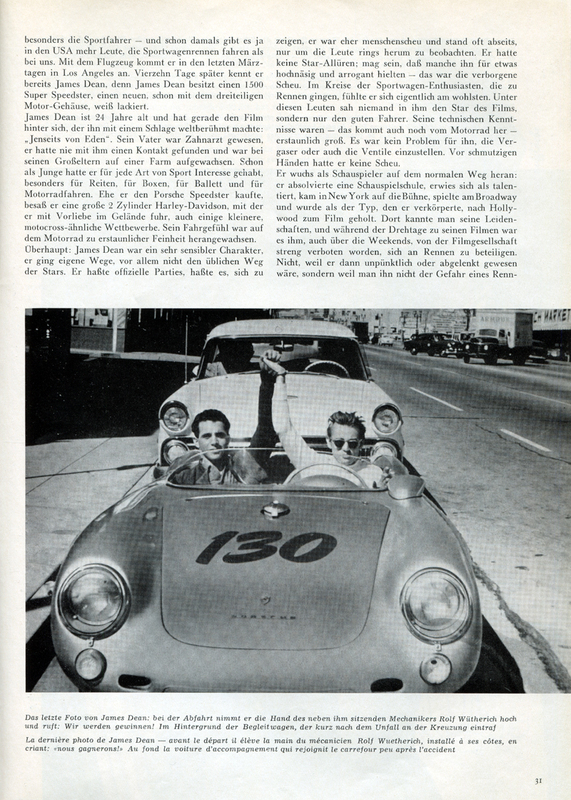 When Jonny von Neumann had five Spyder RS delivered in September — about 100 of this series of sportscar had been sold to private drivers by this time — one was offered to James Dean. He was enthusiastic about this fast car. He set the condition that Wütherich must be allowed to accompany him to every race. And right away the next racing date was set: the Oct. 2 race in Salinas, located about 350 miles (560 km) north of Los Angeles. The film "Giant" had just wrapped eight days earlier. James Dean didn't have time to withdraw his car [from the race], so he decided not to load it onto a trailer but to drive it to Salinas with Wütherich. The road from Los Angeles to Salinas took in a wide stretch of desert; it's wide enough to drive side-by-side in 3's and even pass another vehicle with oncoming traffic. About 2 o'clock in the afternoon of Friday, Sept. 30 — Saturday was the preliminary, Sunday was the race — James Dean left Hollywood with Rolf Wütherich next to him. Two or James Dean's friends followed behind in a Chevrolet station wagon that originally was going to haul the Spyder. Let's take a picture of our convoy, James Dean said. Charlie, take the picture! Charlie was Carl von Delius, the brother of racecar driver Ernst von Delius (killed in 1937); Carl belonged to the Auto Racing Union through Rosemeyer and Stuck and was Johnny von Neumann's public relations man. James Dean hoisted Wütherich's hand as Carl von Delius snapped the picture and yelled out, Hey! We're going to win! Then the group got underway. They wanted to be in Salinas between 9 and 10 at night. It is monotonous to drive in this desert area. Often it's many kilometers straight ahead and one sees nothing but the flat, endless horizon. The heat is sweltering, the air lightly shimmers. The Americans are reasonable people; they know one grows tired easily on such stretches, so they often make a quick stop to drink a Coca-Cola or some juice. James Dean knew it, and after nearly three hours of driving he came to a wooden shack in the desert that had a refreshment stand and a gas station. Here they would rest. At this place was Lance Reventlow, son of Barbara Hutton, who made a name for the Reventlow car — first a sportscar, then a Formula-1 racecar that would debut in Monte Carlo. Lance Reventlow had a 300-SL with him and also wanted to run the course in Salinas; about this time he started training. James Dean chatted with Lance Reventlow; they had fun. But Reventlow soon broke it off. They arranged to have dinner on the way; in the meantime James Dean's friends in the station wagon came and joined the conversation. Jimmy hadn't been particularly fast. The engine still needed some more breaking in. The tachometer was always hovering between 100 km and 160 km, sometimes in third gear, sometimes in fourth, between 4,000 and 6,500 rpm. I always felt safe with Jimmy on the open road, Rolf Wütherich told me. I could have fallen asleep next to him. The theoretical speed limit on these highways in California is 60 mph, or 96 km/h — but nobody observes it on the open stretches unless one happens to see a Highway Patrol car. Police cars patrol in the cities and the arterial roads; they are rarely in the desert. One time on this drive, James Dean had to pay a penalty. The event has been misreported in several articles — that he was racing on the highway and was driving so irresponsibly that that the police were soon on his tail, so it was little wonder that the accident happened. The opposite is true. He was a very well-behaved driver on the road. 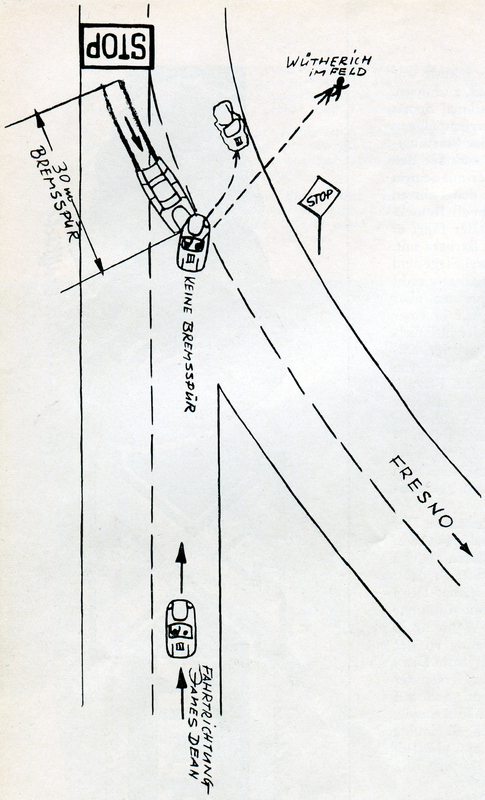 As he was coming into the small city of Bakersfield in the Spyder, the posted speed limit was reduced to 45 mph (72 km/h) on a sort of bypass road. Jimmy drove a bit faster, about 50 mph (80 km/h), but of course the muffler of a Spyder is rather loud. This loud noise attracted the attention of a Highway Patrolman who clocked the speed. The patrolman stopped the car for going 5 mph over the speed limit. The patrolman said: I'm sorry, but I must write you a $5 ticket. He was very polite and began talking to James Dean about the remarkable auto, which interested him greatly. The parted amicably. Blackwell Corner, as the refreshment stand was called, sat about 60 miles (100 km) from the eventual accident site. James Dean drank a Coca-Cola, Rolf Wütherich ate an apple. Don't label me the wild man of this race, he told him. There is a huge difference between the 1500 Super and the Spyder. Get a feel for it. Besides, one of his movie friends added, you've got bigger lessons ahead of you as a racecar driver. Jimmy laughed rather mischievously: I want to be a really good driver, OK? Then he suddenly pulled a ring from his finger and stuck it on the ring finger of Wütherich's left hand: Come, Rolf, you are my guardian angel; you get this ring from me. It was 5:45 p.m. as they came to the fork in the road, which is shown in detail in the sketch. The sun was very low in the sky and shined in both of their faces. The road dipped here into a shallow trough and rose on the other side. At the bottom of the trough, a wide road branched off to the right toward Salinas. The road going straight ahead had the right-of-way, and there is a stop sign at the junction; also there are huge letters on the street showing the direction of travel for people who wanted to turn off to the left. They had to stop here and let the oncoming traffic pass. This latter stop sign is different from stop signs in Germany. One doesn't necessarily have to stop; only when opposing vehicles are present on the road. A car approached, a Ford 8-cylinder, built in 1953, driven by a 24-year-old student who was alone in the car. This student wanted to turn to the left. If James Dean were to approach in the Spyder at the same instant, the Ford would have to stop and wait until James Dean drove by. The curve at the junction is very slight, meaning you barely have to slow down when nothing is approaching. The student drove his Ford as if there were no oncoming car. He later said: I didn't see the Spyder. I only saw it when it was too late. That could be; the street had a sort of mirror-like effect from the sun; the Spyder was painted metallic silver and had a low profile, especially in comparison to the American car. None of that relieves the student of sole responsibility for the accident. James Dean didn't brake, not at all. Quite obviously he thought: This oncoming car must see me, and anyway I have the right-of-way, and he can't be crazy enough to want to cross over my lane. And presumably at the last moment he gave it full gas in order to pass ahead — but that wasn't going to work. The Ford left skid marks of nearly 30 meters. That suggests that in the last two or three seconds the student saw the Spyder, in enough time to veer out of the way. He slammed on the brakes, because that is the natural reaction — but then one can no longer steer. It would have been better if the student hadn't braked and instead tried to steer to the right. But such theoretical and posthumous reflections are pointless. The left front end of the Spyder collided head-on with the right half of the Ford's radiator and bumper. The Spyder continued an estimated 130 to 150 [meters?]. And that was enough. Rolf Wütherich was thrown from the Spyder in a high arc into a field. The camera that that Carl von Delius had used to take the pictures flew out with him into the field. It wasn't found until eight days later. But James Dean remained seated in the car. He was killed instantly. His neck was broken, the steering wheel had penetrated his chest (the left front wheel of the Spyder was at the height of the steering wheel! ), his skull was smashed. The student in the big Ford was fine, as if nothing had happened. Rolf Wütherich was transported to the hospital. He lay above James Dean on a stretcher and couldn't move. He didn't know then that Jimmy was already dead, and even in the hospital he wasn't told until many days later. Rolf's left foot was turned fully around, a major and complicated bone injury. His mouth was full of fractured teeth and splintered wood. But Wütherich had the feeling from the beginning: You will somehow survive this. In the next hospital he went to, in the next small city, they talked about amputating his leg. But that wasn't the right place. Jonny von Neumann advocated for Rolf to be taken — after eight days, even though transport would be difficult — to the clinic of Dr. Neufeld, a specialist and German immigrant who created the Neufeld nail for such injuries. It was still possible to patch up Rolf without amputation. He's been back in Germany for exactly a year. A year after the death of James Dean, the film company was receiving 2,000 letters per week from fans who always wanted to know: What happened? Is he really dead? What were his last words? For a long time there was a claim that he wasn't dead but was disfigured and living somewhere in secret. Others said his ghost would appear every year on that section of road. A fortune teller supposedly predicted James Dean's disaster precisely. So as it has been described by the only witness, so must it remain: a tragic accident which, through inattention, hesitation and an incorrect response, occurred and claimed an innocent. 1. The writer says "Carlchen," which is a diminutive/familiar form of Carl. 2. Actually, the ticket shows Dean was cited for doing 65 mph in a 55 mph zone. 3. The Neufeld nail is an orthopedic nail with a V-shaped tip and shank used for fixating an intertrochanteric fracture. 4. Sinnestäuchung: changing one's mind. 19200 dpi jpegs from original magazine purchased 2015 by Leon Worden.